On my way from the Beechwood Luas Station to a church committee meeting in Rathmines yesterday [11 September 2017], I stopped to visit the Church of the Holy Name on Beechwood Avenue in Ranelagh. 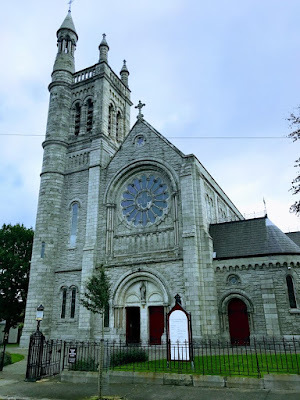 Although I have visited this suburban church in Dublin occasionally in the past, usually for funerals, and although it is on the same street where both my grandfather and great-grandfather had lived at the time the church was being built, I had never paid much attention to this building. Yet it is rich in its architectural and artistic details, with marble and granite pillars, mosaics, Celtic designs, and windows associated with the Harry Clarke studios. The church also has works by the Earley studios in Camden Street and the partnership of Ashlin and Coleman, the architectural practice that links back to the work of AWN Pugin. The parish of Rathmines was formed in 1823, and a number of new parishes were carved out of this parish in the decades that followed as the suburbs of south Dublin grew and expanded. These new parishes included Rathgar at the Church of the Three Patrons (1882), and the Parish of Cullenswood, at the Church of the Holy Name on Beechwood Avenue (1906), which was further subdivided in 1914 and 1974. A temporary chapel-of-ease was built for the Beechwood Avenue area in 1898, and the boundaries of a new parish were delineated in 1906. When the Church of the Holy Name was formally opened in 1914, the new parish was known as Beechwood Avenue. The Ordnance Survey maps in 1837 show Oakley Road or Cullenswood Avenue, Elmpark Avenue and part of Annavilla, Beechwood Avenue and Ashfield Road were not yet laid out and much of the area was part of the nursery gardens of the business that became Toole and Mackey. The railway line through Ranelagh to Bray opened in 1854, the route south of Ranelagh opened up the area adjacent to the future Upper Beechwood Avenue for development. Four houses, including a constabulary office, had been built in Beechwood Avenue in 1870. By 1880, Beechwood Avenue had 26 houses, with No 21 the home of Francis Scully. In 1885, Father Patrick Doyle, curate of Rathgar parish, was living at No 21 Upper Beechwood Avenue. Around 1880, Francis Scully, who was an extensive dairy farmer, bequeathed his house at No 21 Upper Beechwood Avenue to the parish of Rathgar, along with a plot of land for a church. By 1889, Upper Beechwood Avenue had 26 houses and Lower Beechwood Avenue had 12 houses. By 1900, Upper Beechwood Avenue had 66 houses and Lower Beechwood Avenue had 75 houses. The site given for the church by Scully around 1880 was a rectangular plot 250 ft by 167 ft (75 m by 50 m) bounded by Upper Beechwood Avenue and what are now Albany Road and Edenvale Road. In the 1882 deeds, the land is named as Cullen’s Farm. A wooden church was built as a chapel-of-ease on the site and opened in 1898. The builders were Messrs Humphreys Ltd, with addresses in London and at Saint Stephen’s Green, Dublin. Father Thomas Hogan was appointed the first Parish Priest of the new Parish of the Holy Name, Cullenswood, in 1906. Immediately, he began to plan a new church, and WH Byrne and Son, architects, of 20 Suffolk Street, Dublin were commissioned. William Henry Byrne (1844-1917) studied under JJ McCarthy before establishing a partnership with John O’Neill as O’Neill & Byrne in 1869. After O’Neill died in 1883, he practised alone as WH Byrne until 1902, when he took his son Ralph Byrne into partnership. He was responsible for many churches and banks across Ireland. His major work in Dublin was rebuilding the South City Markets in South Great George’s Street (1881) after a fire destroyed the interior. He also designed Saint Joseph’s Church, Terenure (1898-1905) and the Carmelite Friary in Clarendon Street, completed Saint John’s Church, Kilkenny, and worked on the Crescent Church in Limerick. The preliminary plans for the new church on Beechwood Avenue were approved in April 1909. They were based on a simple rectangular plan with flanking porches and a semi-circular apse. But it was decided to add two transepts and the revised plans were approved in December 1909. The church is built partly with Wicklow granite from Osborne’s quarry at Ballyknockan, and partly with granite from south Co Dublin. The columns are of polished red granite, probably from quarries at Peterhead in Aberdeenshire and grey granite bases probably also from a quarry in Scotland. The capitals of the columns are formed with fine-grained concrete, precast in moulds. Woodblock floors are used throughout in the main body of the church. The floor in the sanctuary is mosaic tiling, the porches are floored with patterned tiling, and there is marble flooring in the mortuary chapel. Kevin Toole of 139 Upper Dorset Street was the building contractor. The building was substantially completed in the early summer in 1914 at a cost of £22,068. This included the cost of the high altar, side altars and statues, altar railings and gates, confessionals and the marble lining and alabaster stringcourse in the apse, and miscellaneous carvings in stone and wood. The Church of the Holy Name was formally opened on 28 June 1914 by Archbishop William Walsh. Lining the walls of the semi-circular apse and extending to the side altars is a series of marble panels, pink, black, green, and veined white, all probably from Irish quarries, which extend from the floor to an alabaster string course. The floor of the sanctuary is mosaic throughout. It shows in front of the high altar creatures representing the authors of the four Gospels, Matthew, Mark, Luke and John. These mosaics are the work of Ludwig Oppenheimer of Manchester. A mosaic panel in the north transept commemorates a former parish priest, Canon Daniel Ryan during this period. The panel represents Christ at supper with two disciples in Emmaus (see Luke 24). In the apse ten full size mosaics represent early saints, seen in pairs between the windows. They are Saint Laurence O’Toole, Archbishop of Dublin, Saint Mark the Evangelist, Saint Ambrose of Milan, Doctor of the Church, Pope Saint Gregory the Great (540-604), Saint Matthew the Evangelist, Saint Luke the Evangelist, Saint John the Evangelist, Saint Jerome, translator of the Vulgate Bible and Doctor of the Church, Saint Augustine of Hippo, and Saint Patrick. Other saints depicted in mosaics include Saint Vilnius, Saint Oliver Plunkett, Saint Kevin of Glendalough Saint Remoulds, Saint Columba and Saint Bridget. After the Second Vatican Council, the altar was separated from the reredos and moved forward to allow the priest to celebrate Mass facing the congregation. The pulpit was moved and then dismantled and its elements used in the formation of an ambo and a lectern. Other works were carried out by Earley and Co of Camden Street and Herbert Coleman, the last partner from the Coleman family name in the partnership of Ashlin and Coleman, the architectural practice that succeeded in the works of Pugin. The mortuary chapel was located in the former baptistery and the baptistery was relocated in the north porch. In all, there are 61 windows, including the rose window in the West Front. Fifteen of these windows are rich-coloured stained-glass windows. The windows are the work of Joshua Clarke and Sons of North Frederick Street, later the Harry Clarke studios that closed in 1973. Henry Patrick Clarke (1889-1931) took over his father’s firm in 1921. Although none of the windows in the Church of the Holy Name was made by him, apart from the Rose Window, his hand may have been involved in their design. The Rose Window in the west front of the church was set into position while the church was being built. It is circular with an overall diameter of about 14 ft. A circular pane in the centre shows the Host and Chalice of the Eucharist. The Stations of the Cross in the church were made by Messrs C Bull of Suffolk Street. The frames are made of Austrian and Riga oak. The Stations of the Cross were erected in memory of Patrick Martin, Ranelagh, who died in 1909. A statue in the arch over the main entrance doors at the west end shows Christ holding in his hand an orb bearing the Holy Name of Jesus. An artist’s impression of the finished church in 1911 shows a statue was always intended for this location. However, a strong local tradition suggests this statue was not erected until the early 1920s. The belfry has a stone stairway of 132 steps leading to a flat roof with extensive views across the city and bay. There are 36 steps to the organ loft from the ground floor, and the 96 steps to the bell chamber. The organ is a Telford organ dating from May 1914. Many famous people are associated with the church and the parish Two former Taosaigh were married here: in 1924, Seán Lemass (1899-1971), who signed the register as Shaun Lemass, married Kathleen Mary Josephine Hughes (1898-1985), who lived at 34 Upper Beechwood Avenue; their daughter Maureen also married Charles J Haughey here. 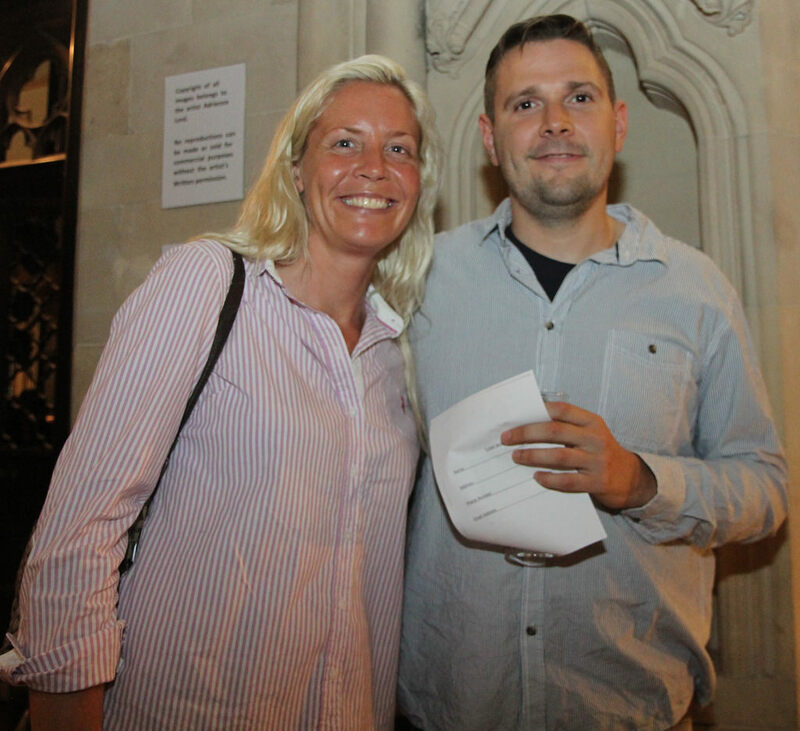 Frequent Mass goers included the former Taoiseach Garret FitzGerald and the poet Padraic Colum. Padraic Pearse was supposed to be the best man at the wedding here of the 1916 leader Thomas MacDonagh, who lived on Oakley Road, and Muriel Gifford of Temple Villas on nearby Palmerston Road in 1912, but he never turned up on the day. Michael Collins, Maud Gonne McBride and Sean MacBride, all lived in the area too, and Maureen O'Hara (1920-2015) the Holywood actor, was baptised in the church and grew up at 32 Upper Beechwood Avenue. The stories of two weddings – the parents of John French, who is remembered in the south porch, and why his parents’ wedding meant he never inherited the family title, and the wedding that Padraic Pearse failed to turn up for – make interesting stories for another day. The inscription reads on the mosaic of the Supper at Emmaus in memory of Canon Daniel Ryan cites part of Psalm 26: 8: ‘O Lord, I love the house in which you dwell, and the place where your glory abides.’ Earlier translations render this as: ‘I have loved, O Lord, the beauty of thy house.’ It is certainly a verse that applies to this church in Ranelagh. 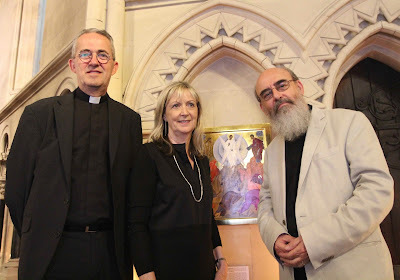 Throughout the summer, Christ Church Cathedral has been offering visitors the opportunity to engage with their spirituality on a different level through its Summer Exhibition of Icons. The exhibition, which features the work of iconographer Adrienne Lord, officially opened in June and continues until the end of September. The icons are for sale and the proceeds will be donated to charity. 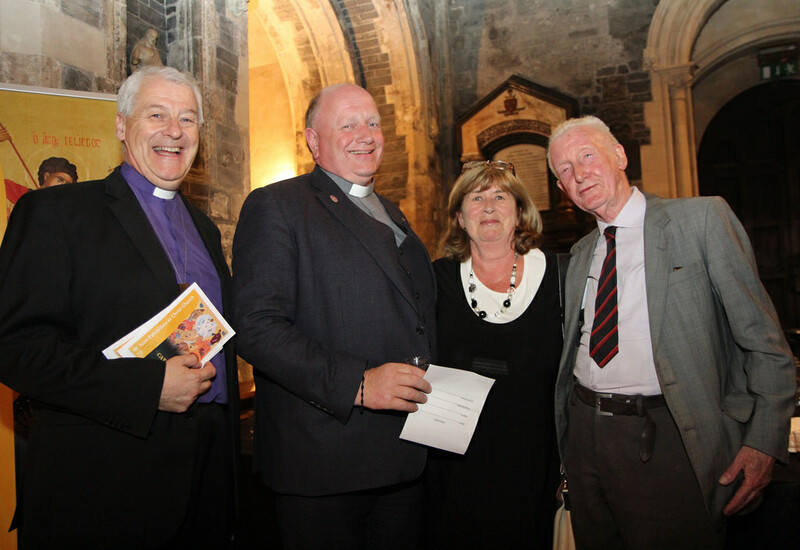 The exhibition was launched by Canon Patrick Comerford, Precentor of St Mary’s Cathedral in Limerick and priest-in-charge of Rathkeale and Kilnaughtin Group of Parishes in Limerick. Canon Comerford has a keen interest in icons. He said that the word ‘icon’ had been demeaned in recent years – we have icons on our computers and we talk about people, such as film stars, in terms of being icons. However, he said Christ is the icon of God and the first icon is Christ. He pointed out that we do not worship icons but can be drawn into a spiritual experience by an icon. He said there was a temptation to look at icons as idolatry but this was not the case and neither is sufficient to look at an icon as a work of art without regard for its spiritual dimension. Canon Comerford paid tribute to Adrienne’s interpretation of the icons, which have mainly been inspired by Greek as well as some Russian icon writers. ‘These icons all give you the idea that we do not have a static relationship with God but rather a dynamic relationship with God … What you are looking at is an interpretation of art, beauty, dynamism and spirituality,’ he said, adding that icon writers are among the first and last theologians because they allow us to speak about God but also to enter into a relationship with God. There are demonstrations by the iconographer on the last Friday of the month between 11.00 am and 1.00 pm and 2.00 pm and 4.00 pm.